Home MuppiesBlog Featured Member Energy Director Founds MuslimMatters, Inc.
Our featured member for February 2015 is Amad Shaikh. After graduating as a chemical engineering major from college, Amad worked at Valero Energy Corporation in Houston before going back to get his MBA at UPenn. He is currently based out of Qatar in a management position at an energy company. 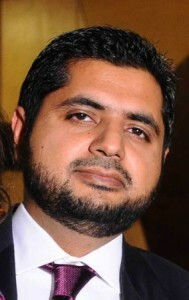 He is also is one of the founders of MuslimMatters, Inc. He has been involved with Texas Dawah, Clear Lake Islamic Center and MSA. His interests include politics, cricket, and media interactions. Read more about Amad’s experiences below. Can you describe your professional journey for me? Why did you decide to be an engineering major in college? What motivated you to get your MBA? I always loved math, so engineering was a natural choice for me. In high school, I had a wonderful chemistry teacher, which made me decide to join my interest in math and chemistry and pursue chemical engineering. It is amazing how much a teacher can influence his or her student’s educational, and eventually, career trajectory! After my BSc. degree (1996), I started my career in an oil refinery as a Process Engineer at Valero. Ten years after college, I felt I needed to do something different with my life, whether that was a career shift or an industry shift, and I thought that an MBA from a top-tier school would be that catalyst for change. Combining engineering with an MBA would allow me to not only fit pieces together like an engineer but also evaluate the big picture and if fitting pieces together was even the right business decision! I think engineers can get boxed-in on their perspectives at times, and a MBA really helps you think outside the box and opens your mind to endless possibilities. Coming up with a great solution is only half the journey. Selling that solution is the other half, and an MBA is a helpful bridge. I decided to enter into an executive program and targeted the top 3 schools in proximity- Columbia, NYU and Wharton. After a lot of research, it was clear that Wharton was the only school that duplicated the entire curriculum of its regular program in a jam-packed 24 month executive program. Of course, it was also the closest to my residence making it an easy choice. Between juggling work, family and a full-time masters program, I have to say that those two years were the most difficult years of my life, but also the most rewarding. What was the story behind the foundation of MuslimMatters, Inc? What inspired you to start it? How have you seen it grown? What’s your vision for it? It was November 2006. I had belatedly joined the blogging bandwagon, which had significantly matured as a social media outlet. I wanted to write about US politics, religion and life in general. I remember checking my blog’s stats every day. You can put tens of hours into a post, but if no one reads it or engages with it, you feel like a complete failure. It’s like the tree that fell in the forest – did it make a sound if no one heard it? That’s the same with a blog post. Did it really mean anything if no one read it? After a few months of struggling with bringing people to my blog, and noting the tendency of readers to jump from one blog to another, the solution seemed obvious: bring together the various voices of Islam, mostly like-minded, under one umbrella and add a “cornerstone Shaykh”. With this mission in mind, I contacted my college mate, friend, and Shaykh, Yasir Qadhi, who was quick to latch on to the idea. Having secured Shaykh Yasir’s okay, I proceeded to collect a diverse, “A-team”. The question of “why this blog” was never fully answered. We went in circles, and the only clear idea we could all agree upon was that we needed a voice for “mainstream”, “average” Muslims on the blogosphere. We also agreed that a groupblog would provide much more exposure and many more readers than individual blogging efforts. The simple blog was a hit almost immediately, and traffic drove up exponentially. Eventually, we added more and more writers, re-designed the platform a few times and also hired help. Over 20 million have visited the site, from every country in the world. Materials been used by average Muslims, by professionals seeking to understand Islam, by law-enforcement, and by teachers and students. Some of the articles have been ground-breaking, especially when it comes to taboo issues in the Muslim society. Today, the blog has been transformed into a webzine, and our vision for it to be the Christian Science Monitor of Muslims in the future. My role now is only in an advisory function as Chairman of the board, with active operating and executive leaders. So far, the website has remained a non-profit as a 501-c-3 corporation. There are other plans in play to reorganize and retool the organizational and legal structure. We have declined many requests to be merged by others because we feel that the site provides a unique perspective that is better on its own. What advice do you have to someone who is considering getting their MBA but is still uncertain? I would like to add some more scope to the question. It is not just making the decision to do a MBA, but where to do it that I find is often more critical. I realized that while the education itself is important, the brand-name of the MBA school was at least equally important, if not more. So, unless someone is in it for the love of studying business, I would strongly advise that one targets business schools that are universally considered top-tier. Universally is an important qualifier; just because one publication out there lists some average school higher than Harvard, doesn’t mean it will get the same respect. It is only through failures that you will ever develop and move up. I had started a small internet business more than a decade ago with three other friends. An ecommerce site that sold ethnic and cultural clothing/jewelry/etc. None of us has MBAs at the time. None of us had any experience with ecommerce or even with what we were going to sell! Yet, we felt that ecommerce was the way to go, and we jumped in with full commitment. I cannot remember how many hours we spent on this business, but it was almost an entire day every week plus many additional hours throughout the week. I poured my heart and mind into the venture. Others were less committed, but also spent a lot of time. Eventually, the business failed. We barely broke even after years of trying to keep it going. But failure is only fatal if you allow it to be. There was so much I learned from this experience, such as the many issues that partnerships are fraught with, the mixing of friends and businesses, expectations versus rewards, doing what you know and not doing what you don’t, and so on. Eventually, I dabbed into other businesses as well, and the experiences from this failed one have always been invaluable. What is the experience like working abroad in Qatar, professionally as well as from a society/personal perspective? A comprehensive answer to this would require a novel, but here’s the short version. I was raised in Dubai until I went to college in the States, so I spent my entire adult life in the States until returning to the Middle East over 5 years ago. Even while having Middle Eastern upbringing, the change was somewhat traumatic in the beginning, but we have settled down. Settling down usually still means temporary as there really is very little permanence in the Middle East. You are on a job visa here, and if that changes, then you can be out on the next flight. How you settle in really depends on the type of person you are. Talking purely from a perspective of a job (not starting a business): If you are a dynamic go-getter type personality, if you like systems, fairness, then you will suffer. Systems in the Middle East are very much designed along nationality lines. Locals get priority so many times you may be supremely qualified compared to a national, but promotion would be out of question. Also, things work on their own slow pace here. If you show too much dynamism, you are setting a bad precedent. If you are an Arab, that is a big advantage. If you liked to be involved in your community, in your civic organizations, in political organizations, then you can kiss those activities goodbye as well. For all these trade-offs, you get a fat check and some tax advantages (although the US government is one of the only governments in the world that taxes you on earnings abroad after a deduction). Financially, most folks will be better off; otherwise, why make the sacrifice? However, you will find many Western Muslims who come for religion/culture. No doubt, it is much easier to practice rituals and raise children here, and that can weigh heavily especially, if the person did not have a strong Muslim community where he/she came from. How long have you been a Muppies member, and how have you benefited from your membership? Muppies has been valuable for networking as well as providing an excellent platform for Muslims to engage upon. I especially like that it is free of sectarian or other harmful vibes. I joined Muppies a while back (in light of the famous NYT article), and I continue to see so much potential in the group. Helping each other, as Muslims, even in the worldly sense, is also worship. Read Amad’s work on MuslimMatters, connect with him through his Linkedin profile, or follow him on Twitter at @amadshk. Each month, Muppies features one of our members to share about their professional development story and the insights they’ve gained along the way. This interview was originally conducted in February of 2015. Opinions are of the member and do not necessarily reflect the opinions of Muppies, Inc.